Produktinformationen "Special Lecture on Korean Paintings"
Special Lecture on Korean Paintings provides readers with a comprehensive and readable introduction to major aspects of classic Korean art. The volume explores the vast heritage of Korean paintings, providing a rich panorama of information that stretches across the entire spectrum of Korean paintings, which will have wide appeal, not least to art lovers and students of Korean Studies. The book is largely composed of three parts: Part I, Principles for Appreciation of Old Korean Paintings, introduces basic principles for appreciation of Korean art. The author suggests to see old Korean paintings through the eyes of the past and feel them with the heart of the past; Part II, Heart of the Ancestors Expressed in Old Paintings, explains the life and wisdom of Koreans of the past, including their view of the universe and life based on the theory of yin and yang and the Five Elements; Part III, History and Culture in the Joseon Period Examined through Old Paintings, presents the beautiful and truthful mind of old Koreans revealed in their portraits and paintings. The author contends that old Korean portraits or calligraphy works were a true reflection of the spirit and mind of the people, whereas today's counterparts are devoid of such spirit. To add more, the appendix to this book covers the art and life of Kim Hong-do, who was lauded by contemporaries as a "national artist," including 12 of his representative works. Throughout the book, the author takes a humanities approach to various topics, ranging from the climate, history of Korea, and Chinese poetry to human spirit and aesthetics of Korean people. He maintains his objectivity as an art historian, while at the same time takes great pride in Korean history and culture. His narrative approach will make you feel as if you're sitting in the middle of a lecture listening to him, while you're reading this book. Oh Ju-seok majored in Eastern history and earned his master's degree in Archaeology and Art History at Seoul National University. Before taking up teaching positions at Chung-Ang University and Yonsei University, he was an art writer for the Korea Herald, an English-language daily, and curator at Ho-Am Art Museum and the National Museum of Korea. 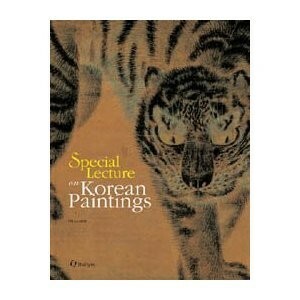 He toured the country giving lectures on the beauty of Korean art. His publications include The Joy of Reading Old Korean Paintings I & II, The Art of Kim Hong- do, The Golden Age of Korean Culture, and Yi In-mun's Mountains and Rivers without End. He passed away of leukemia in 2005. Weiterführende Links zu "Special Lecture on Korean Paintings"
Unser Kommentar zu "Special Lecture on Korean Paintings"
Kundenbewertungen für "Special Lecture on Korean Paintings"